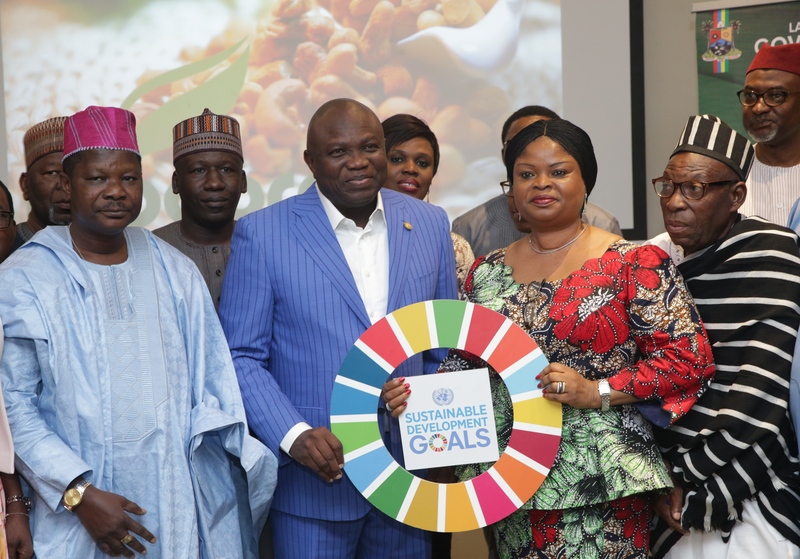 Lagos State Governor, Mr. Akinwunmi Ambode, on Monday evening said the Y2019 budget of the State would be dedicated towards the completion of ongoing infrastructural projects, creation of more jobs, supporting businesses to thrive, as well as strengthening the security architecture of the State. 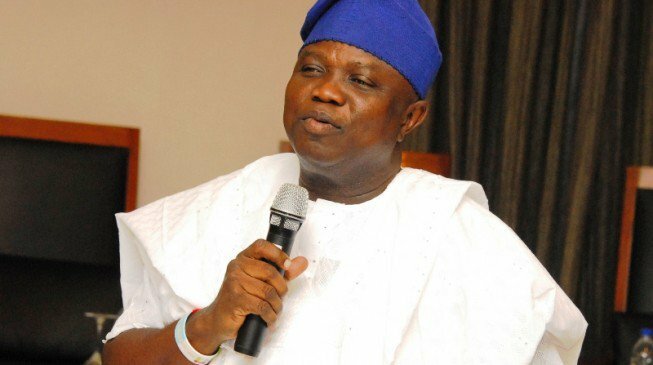 Speaking separately at the Christmas Eve Dance of Yoruba Tennis Club and Island Club, two foremost social clubs in the country, Governor Ambode said while it was gratifying that a lot of provisions had been made for capital projects in the 2019 federal budget, the State Government would also concentrate on scaling up infrastructure, among other programmes to enhance growth and development. Alluding to the positive economic projections for Nigeria in 2019 by the International Monetary Fund (IMF), Governor Ambode said Lagos, on a stand-alone basis in the year under reference, would achieve four percent growth in Gross Domestic Product (GDP), adding that the social intervention initiatives of both the State and Federal Governments would also go a long way to facilitate serious reduction in unemployment rate. “The economic outlook for 2019 is quite positive. A lot of provision has been made for capital projects in the 2019 Federal Budget, some of which will directly impact the economy of our State and will support our growth plans. On our part, we will concentrate on completing existing infrastructural projects, creating more jobs, supporting our businesses to thrive and strengthening our security infrastructure. “According to IMF, the Nigeria GDP will grow from 1.9% in 2018 to 2.8% in 2019. Lagos on a stand-alone basis will achieve over 4% growth in GDP and this could be more if the congestion at the port and the negative effect this has on the economy is addressed. We expect that the high rate of unemployment will reduce with various social intervention programmes of the State and Federal governments geared towards financial inclusion and liquidity support to micro, small and medium enterprises,” the Governor said. While recalling the activities of his administration in the last three and half years, Governor Ambode said it was particularly fulfilling that the State had made tremendous progress in all sectors of the economy and had become more globally competitive and strategically positioned among the major City-States worldwide. “Three and a half years down the line, our State has progressed in all sectors of the economy. We have charted a clear path to the destination we have all dreamt about and desired. Today, our Lagos has become more globally competitive and strategically positioned among the major City-States of the world. Our State has become a top destination for business and tourism and it can only get better. “One of the key promises I made at my inauguration on May 29th, 2015 was to make our State work for all; to spread development from the already congested City centre to other parts of the State with massive infrastructural development. The thinking has been to make every part of the State economically liveable. “We have undertaken projects in all sectors of the economy with the sole intention of making life better for our people. All of these and similar initiatives were made possible by the personal taxes of high net worth residents of our State represented at this gathering which account for a significant percentage of our IGR and I want to use this opportunity to thank you so much for providing the resources, which have empowered us to make a positive difference in the lives of all citizens of our State,” he said. Besides, Governor Ambode said it was obvious that the State could not afford a break in trajectory of progressive governance at this point in time, and urged the people to continue to support the ruling party in the State. He cited the recently launched Lagos Health Insurance Scheme designed to guarantee access to quality healthcare delivery for all Lagosians, saying it was instructive that the Bill for the scheme was signed into law by his predecessor, Mr Babatunde Fashola, while the process for its implementation was kick-started by his administration. “This is the beauty in continuity and we have the assurances of Mr Babajide Sanwo-Olu, governorship candidate of All Progressives Congress (APC) in the State that the initiative will be sustained. “Lagos State cannot afford the risk of a break in the trajectory of progressive governance at this crucial stage of development. The future is bright and assured. We must maintain continuity of progress in the State,” he said. Governor Ambode also commended the clubs for their immense contributions to the development of the State, and charged them to continue to play key part in taking Lagos into a brighter and more prosperous future. 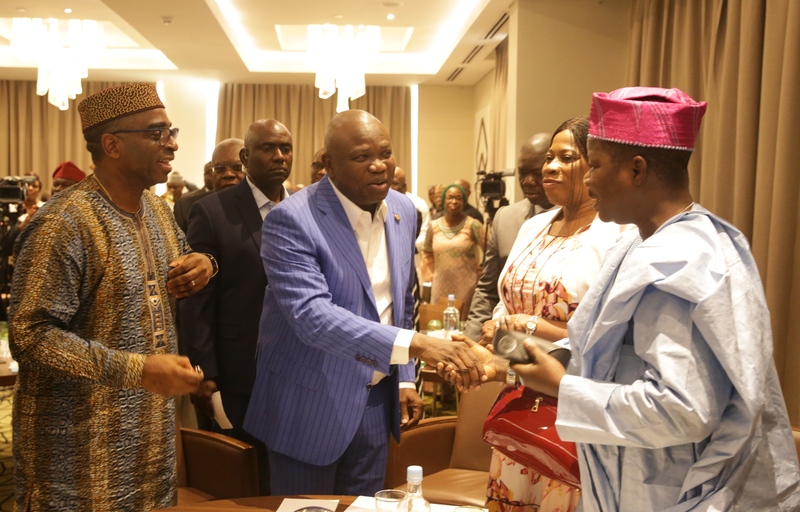 In their respective addresses, Chairman of Island Club, Mr. Olabanji Oladapo and his counterpart in Yoruba Tennis Club, Professor Adetokunbo Fabamwo commended Governor Ambode for the various infrastructural projects executed in the clubs, saying it was laudable that the Governor kept his promise. 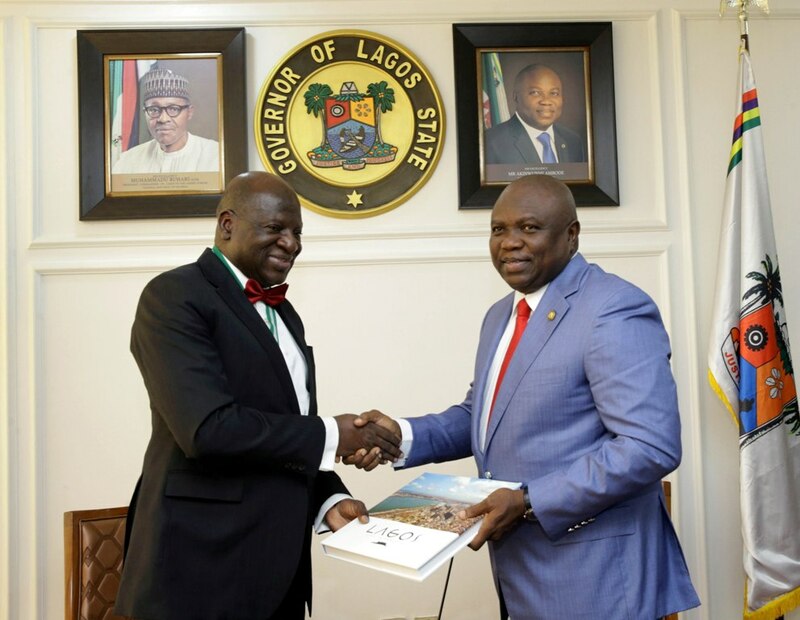 President, Institute of Chartered Accountants of Nigeria (ICAN), Alhaji Razak Jaiyeola and his counterpart in the Institute of Directors (IoD) of Nigeria, Alhaji Rufai Mohammed on Tuesday lauded Lagos State Governor, Mr Akinwunmi Ambode for his sterling performance since assumption of office in 2015, saying his achievements across all sectors and sections speak volume and were visible to all. Jaiyeola and Mohammed, who spoke separately when they led members of the Governing Council of their respective Institutes on a courtesy visit to the Governor at Lagos House in Alausa, Ikeja, said it was gratifying that the current administration had exemplified good governance in all facets of the State. 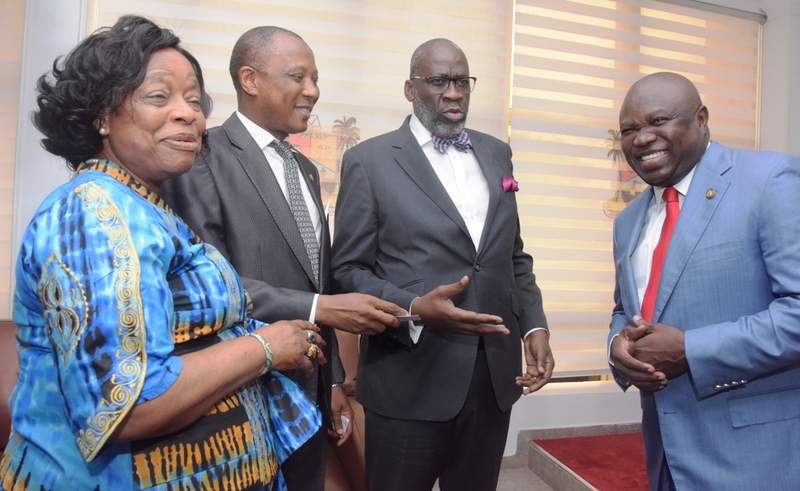 Lagos State Governor, Mr. Akinwunmi Ambode; with members of Governing Council, Institute of Directors (IoD), Mr. Oba Ladega; Mr. Akin Iroko and Natinaol President, Nigerian Association of Chambers of Commerce, Industry, Mines & Agriculture (NACCIMA), Iyalode Alaba Lawason during a courtesy visit to the Governor by the Governing Council of IoD, at Lagos House, Alausa, Ikeja, on Tuesday, September 11, 2018. The ICAN boss specifically congratulated Governor Ambode for picking the nomination form to re-contest the Governorship election in 2019, saying the institute was proud of his outstanding performance in office, and would support him again to continue the good works in the State. “We appreciate the good works of the Governor; you are doing excellently well. You are not only a touch bearer of our institute, but also a beaming light of our profession. We appreciate your good works and I note that they have been very very outstanding and so on behalf of the Governing Council, I want to appreciate the Governor. 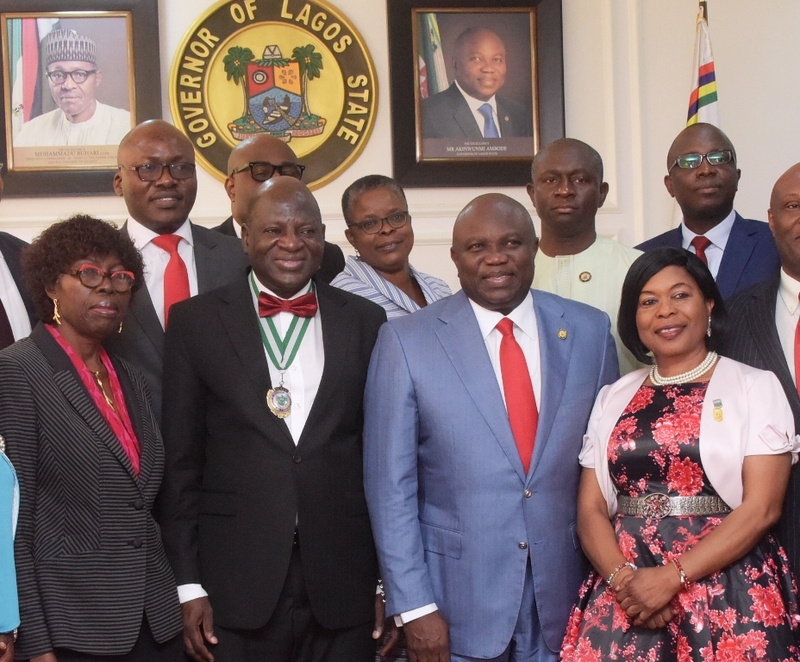 Lagos State Governor, Mr. Akinwunmi Ambode (2nd right), with President, Institute of Chartered Accountants of Nigeria (ICAN), Mr. Razak Jaiyeola (2nd left); his Vice, Mrs. Comfort Eyitayo (right); Past President of ICAN, Princess Adenike Adeniran (left) during a courtesy visit to the Governor by the members of ICAN Governing Council at Lagos House, Alausa, Ikeja, on Tuesday, September 11, 2018. With them: Commissioner for Finance, Mr. Akinyemi Ashade (right behind); his counterpart for Energy & Mineral resources, Mr. Olawale Oluwo (2nd right behind); Permanent Secretary, Ministry of Finance, Mrs. Olufunmilayo Balogun (middle behind) and member of the ICAN Governing Council, Dr. DejiAwobotu (left behind). “I want also to congratulate you on picking the nomination form to contest for the Governor of Lagos State. I want to assure you that as we have always done because you are a performer and it is glaring to even a blind person of feeling the impact of your administration. we would support you as we have always done,” Jaiyeola said. On his part, Mohammed said it was instructive that new projects were always springing up in various parts of the State, saying the Governor had aptly exemplified that good governance was possible. “Your Excellency, the Institute of Directors of Nigeria commends your administration for the great achievements you have made so far in the State in many facets and most especially in the areas of good governance and the development of human capital and infrastructure. 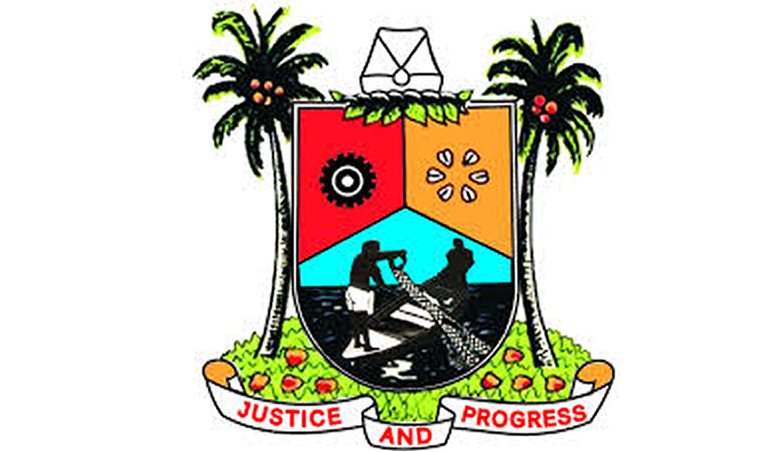 Under your able leadership, Lagos State has been able to distinguish itself in this country in the areas of security of lives and property of the citizens, improved ease of doing business, attraction of direct investment, self-sustenance and good ethical conduct in the implementation of government works and services. “We would like to especially observe that the sterling achievements of your administration have been made possible by your strict adherence to the principles of good corporate governance in the affairs of the State. The IoD Nigeria Governing Council therefore salutes you and your able team for the courage and commitment in building an enduring culture of good corporate governance and ethics in your administration and in the management of the affairs of Lagos State,” Mohammed said. Responding, Governor Ambode said since assuming office, accuracy and integrity were the watchwords for his administration which, according to him, had facilitated the transformation in all parts of the State. Addressing the requests by the institutes for collaboration with the State Government in key areas, the Governor said an international convention centre and a professional layout zone were already in the works, with the view to hosting international conferences and ensure seamless operation of professional bodies. “More importantly, we want to once and for all have a professional layout in Lagos State and then have all other professions having their complex side by side in the State so that we can go on a particular layout and have maybe lawyers, engineers, COREN, ICAN and so on. Lagos State Governor, Mr. Akinwunmi Ambode (right), presenting a souvenir to President of Institute of Chartered Accountants of Nigeria (ICAN), Mr. Razak Jaiyeola during a courtesy visit to the Governor by the members of ICAN Governing Council at Lagos House, Alausa, Ikeja, on Tuesday, September 11, 2018. “Like you would have seen across the State, there is a huge level of infrastructure that is coming up and we believe strongly that part of what we should really do is to promote tourism and economic activities and in that regard, there is a planned convention centre that is in the making that we are putting up with others and in another few period, the layout will come out and it will also encourage economic activities and tourism, among others,” he said. On entrepreneurship development raised by IOD Nigeria, Governor Ambode said though a lot had been done in scaling up small scale businesses especially with N25billion Employment Fund, among others, he was nonetheless opened for further partnership to secure the future of youths in the State. 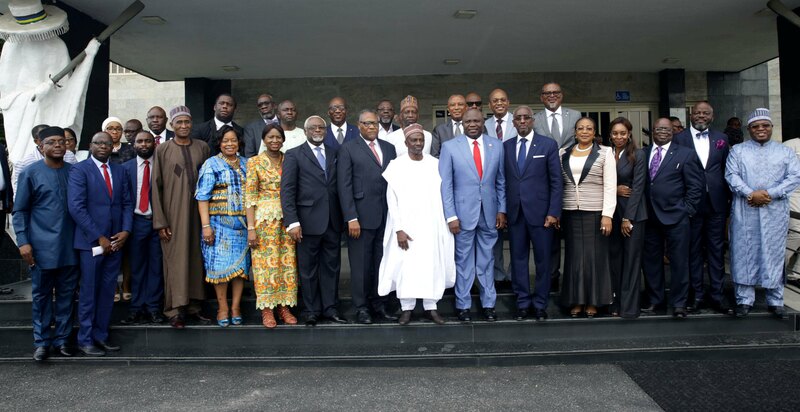 Lagos State Governor, Mr. Akinwunmi Ambode (middle), in a group photograph with the President, Institute of Directors (IoD), Alhaji Ahmed Rufai Mohammed and members of the Governing Council during a courtesy visit to the Governor, at Lagos House, Alausa, Ikeja, on Tuesday, September 11, 2018. “65 per cent of Nigeria’s population is below 35 and technically in Lagos and so we have a youthful population in Lagos. So, somebody somewhere must be able to sit down and ask questions about what would happen to the young ones in the next five to ten years and we know that we have to plan for them and that is why I welcome the collaboration,” Governor Ambode said. We have just witnessed the swearing in 6 (six) newly appointed Permanent Secretaries in the Lagos State Public Service. I congratulate you all for being considered worthy of this appointment. The decision to single you out for this recognition and elevation was therefore not only informed by the vacancies created, but more importantly, the fact that you possess qualities which stand you out among your peers. We believe strongly that our State Public Service deserves nothing but the best. Our vision to build a Modern Smart City-State can only be driven and actualized by matching ability with responsibility. This is a key philosophy which has guided all our actions since we assumed office. I have no doubt in your capability to add value to governance and contribute to the realization of this administration’s short, medium and long term plans. You are well acquainted with the driving overall policy objectives of this administration which include selfless service, inclusive governance, fair and just distribution of resources among our people as well as deployment of best global practices in service delivery. I urge you to ensure that all your actions, as much as possible, are in conformity with these policy objectives. I look forward to seeing your positive impact in the State Public Service especially in the area of improved efficiency and effectiveness with which government business is handled, keeping in mind that we can only be adjudged to have done the right thing when our people are happy and satisfied. Once again, I congratulate you all and wish you resounding success in your new positions. Itesiwaju Ipinle Eko Lo Je Wa l’ogun! I am happy to welcome you all to Lagos for this 2nd National Committee on Export Promotion Meeting. The decision of the Federal Government to establish the National Committee on Export Promotion to promote Nigeria’s non-oil export-led economic diversification is a wonderful initiative as our nation can no longer depend on only oil. As a nation, we must improve our balance of trade. To achieve this we must go back to the basics. From the early history of nations and kingdoms, International Trade has been the basis of the wealth of nations. Wealthy nations export more than they import and they usually have multiple export products. To achieve the status of a wealthy nation, it is obvious and imperative that we must export more. Speaking of export, in the past two days, we have played host to President Emmanuel Macron of France. As you may all know, President Macron’s first port of call in Lagos was the Afrikan Shrine. We learnt that he has been a lover of Afrobeat music for over a decade and this was at the core of his interests in Nigeria. What does that tell us? For me, it is clear that Afrobeat is a product we can export. But not only Afrobeat but Fuji and Highlife; Nollywood; our fashion and our art. There are a lot of other products we can export in the arts and other sectors but we must put in place the infrastructure and framework to support these industries. As you discuss the modalities for implementing the Zero Oil Plan (ZOP), a component of the Economic Recovery and Growth Plan (ERGP) of the Federal Government, and showcasing landmark export projects of participating states, I want to urge that we think outside the box. As a State, we have keyed into several export-oriented initiatives such as the One State One Product (OSOP) initiative spear-headed and monitored by Nigerian Export Promotion Council (NEPC). Through this initiative, our State has identified and commenced the process of developing three key commodities in which we have comparative and competitive advantage – coconut, fish and vegetables. We plan to facilitate the development of these commodities into exportable products. Our export promotion initiatives also include export aggregators designed to boost productive capacities of our indigenous micro, small and medium industries. The objective is to create locally-made products and services that not only satisfy local markets but meet competitive export demand. Development of Lekki Free Zone as a one-stop export processing zone. Supporting the Made in Lagos campaign to enhance market access for our MSMEs. Distinguished Participants, Ladies and Gentlemen, these initiatives are some of our State’s programmes to support the Zero Oil Plan of the Federal Government. But we can do more. I am very hopeful that this meeting would come up with a viable and sustainable agenda that would at the end of the day help us in achieving our economic re-birth without reliance on the oil. Let us expand the scope of our export considerations and increase the wealth of our country. If one of the most powerful men in the world is a lover of our music and culture, then we must look inwards and find ways to export this. Our State is big on Arts and Entertainment and we believe strongly that this is a very lucrative avenue to create wealth and employment for our people. Once again, I welcome you all to Lagos and I wish you very rewarding and impactful deliberations over the next two days. While here, I welcome you all to explore our State and see at first hand the many potential export opportunities we possess. On this note, Your Excellency, distinguished Ladies and Gentlemen, I formally declare this 2nd National Committee on Export Promotion Meeting open.